Urbanization pushes more and more people all over the world to move from the country to the massively growing urban conglomerations. According to the UN report, published in mid-May, by 2050 68,4 percent of world population will breath the city air on a daily basis. As reported by the statistical yearbook 2017 now three quarters of Germans (77%) live in densely or intermediate populated areas, and in 2050 the figure will probably grow to 84,3 per cent. Cairo and Delhi are becoming increasingly dense, density is also on the rise in Frankfurt and Munich. According to CSO data the population density indicator is growing also in Poland. Higher, tighter, more narrow – this is the motto. Housing density is increasing. At the same time, cities are craving safety, privacy, peace, light and nature. Therefore, it is a fact that you may significantly improve your life quality in the city if you care about the proper choice of woodwork during construction process. Rather than trees, what grows in the city is steel and concrete. This is a good reason to invite nature home. Wood is natural, stable and resistant. It lives and it radiates warmth, each element is unique. DRUTEX manufactures windows from carefully selected pine, meranti 450+ and larch wood. The rich range of finishing and transparent paints enables individual arrangement of the interior. Eco-friendly windows covered by a special water-based coating are highly durable thanks to the profile that covers the aluminum, protecting wood against UV rays and rainwater, as well as the thermos-drip that facilitates water drainage. Since 2015, thanks to the DUOLINE 68, 78 and 88 systems, DRUTEX has been also offering windows made of wood combined with aluminum. They combine classic and elegant styles with modern architectural trends. The system also has rich design - rectangles, trapeze, arches, circles or other sophisticated shapes. Right or wrong, studies conducted by researchers from Temple University in Philadelphia indicate that city dwellers have higher fear of crime due to a feeling that public order is being eroded – for example when it comes to buildings covered in graffiti or littered streets. Your own home may become a safe haven in such circumstances – a kind of barrier against the outside world. This sense of safety can be achieved when the inhabitants of the house or flat may rely on good burglar protection. Crime statistics show that 80 per cent of burglars break into the house through the window. Drutex systems, equipped with anti-burglary solutions, may constitute an effective barrier against such incidents. DRUTEX has been using wood, aluminum as well as PVC for ages to produce its windows. Profiles are of key importance for the systems – they should have as high quality as possible, for PVC products, they should be made of prime material in A-class. It’s important that they have good steel reinforcement. DRUTEX applies Maco Multi Matic KS fittings in its products. The key advantage of properly equipped windows is high safety guaranteed by the anti-theft pivots. With the application of the innovative solution as a standard Drutex offers windows with two pivots that work together with the anti-theft hook and with the standard hook. Window handles and security locks that lock with a key, ensure other options, including a special glazing e.g. with safe or hardened glass, in order to prevent burglary. If you want to be sure that your goods are safe when you are out, you should consider buying the so-called smart home technology. DRUTEX enables its clients to control the whole home appliances with a smartphone, a tablet or a computer. Thanks to TaHoma Somfy solutions the house becomes smart and the life of its inhabitants gets safer and more comfortable. The family may delegate the responsibility to the absolutely infallible system. With the use of the computer we may create up to 40 control scenarios and activate them manually, automatically at specific times or – depending on the signals generated by sensors – day and night, wherever you are. According to Somfy TaHoma system allows to control over 100 various products in the technology with a smartphone, a tablet etc. then, for example, roller shutter may close by themselves, doors and windows may lock. And the owner is able to check remotely if his or her instructions have been executed. In order to ensure top safety, DRUTEX also uses activPilot Comfort PADM fittings from Winkhaus, equipped with electric drive. They enable to open the window max. 6 mm, which guarantees air circulation, and at the same time it protects the home against rain and noise and against burglars. In this ventilation option there is also a possibility to build windows with enhanced burglary protection in RC2 class. City dwellers on a daily basis are exposed to noise coming from different sources. Since it penetrates into the flats mainly through windows, investment in proper noise insulation is particularly important. The sound reduction index Rw gives the information regarding the protection against environmental noise that the windows offer. We need to consider it if our house is near busy streets, railways or an airport. Then we should opt for windows with noise-absorption glass of Rw index at 36, 39, 40 or even 50 dB. However, if environmental noise doesn’t exceed 60 dB, windows of Rw = 30 dB will be perfectly enough. Roller shutters ensure extra protection against burglars and noise, but, above all, they guarantee anonymity and privacy in cities where neighbors live closer and closer to each other. PVC or aluminum roller shutters offer numerous advantages, apart from energy efficiency and noise protection they enhance safety. The possibility to close and open them remotely, when we are out, enables to mislead a burglar and to protect against intruders. Investment in roller shutters is cost-effective since the new systems stand out for great functionality as well as aesthetics. We offer the possibility to match the external roller shutters with the interior of the house and the building elevation. It seems that roller shutters, just like the window, may constitute an element of decoration and give the building a sophisticated look. More importantly, when buying the roller shutters from the same producer who offers windows and doors, we have the option to obtain a uniform, consistent look of all the woodwork, which is very important in the construction or renovation of a house. After all this our pride and long-term investment. However, it is crucial to analyze thoroughly the system advantages and characteristics when choosing the right company. It turns that that the devil is in the details. All in all, elements such as special adapters or reinforcement consoles that improve stability and durability, thus the functionality of the roller shutter, play a significant role in their long-term usage. Surely most city flats lack space. 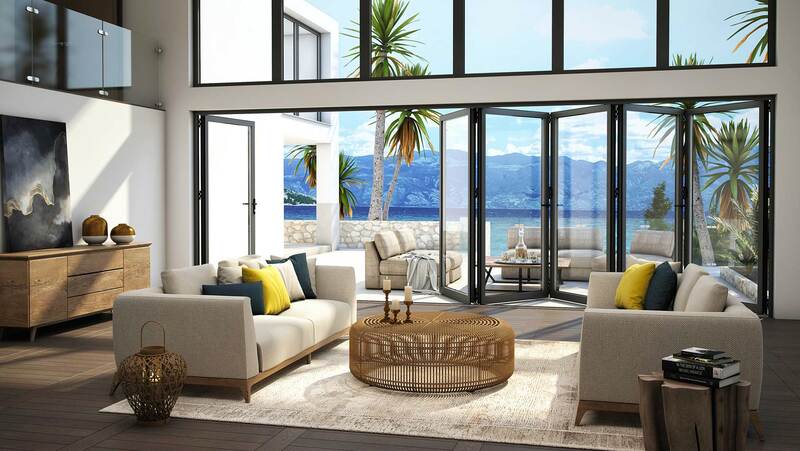 You are lucky if you have a small, cozy balcony or terrace – especially in summer, when living space is enlarged by the exterior that optimally connects with the interior. Under no circumstances should you give up large glazing, since it ensures a lot of daylight despite the city shading. However, we should remember: with simple balcony doors that were popular 15 years ago and are still installed now sometimes, we aren’t able to create a beautiful exit to the terrace. Investment in a modern terrace system will pay off. Another important hint: slide doors will work better than tilt doors, especially in small flats. They do not take up space when opening and they enable individual interior arrangement. In DRUTEX lift and slide systems one sash slides parallelly on the other one – this way even when the door is open you don’t lose even a cubic centimeter of space. Various options of sash arrangement enable different opening methods, according to needs and the building project. The client also has a wide choice when it comes to door arrangement and matching it to the interior and building design, regarding the construction material, as well as the color, form and functionality. Trendy exit to the terrace – perfect not just in summer! The heat is taking its toll. This year summer has been spoiling us with high, almost African temperatures. We value the terrace especially in summer, when it constitutes an extension of the day zone and if it is properly connected with the home space. New year is more than just a change of the number in the calendar.